The my PC Techs team wants to make you aware of a new and very serious virus that’s going around. The name of this disturbing new virus is CryptoLocker. 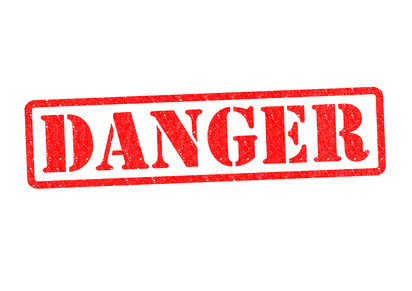 The reason for this urgent warning is due to the extreme nature of the threat. CryptoLocker encrypts and “locks” all of your personal computer files in a way that makes it impossible to recover them via normal methods. The virus also reaches out over a network to attack other nearby computers, and can easily take down an entire office of computers if left to run free. You will only regain access to the locked files after paying a $300 ransom per computer to the criminals who wrote the virus. Call a meeting with everyone in your company and speak with all family members in your home. Remind them to never open an email attachment unless they are expecting the attachment in advance. Even if they are expecting an attachment, double check the attachment very carefully before clicking on it. The virus is usually disguised as a file inside of a .zip file sent via email. 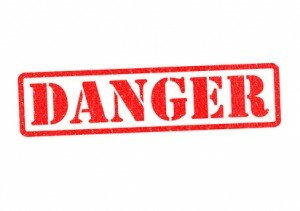 The virus will come with a normal looking icon such as a Word Doc or a PDF file, but the file extension of the attachment will be an .exe file or something else that you don’t recognize instead. Make sure you have anti-virus software that is up to date and functioning properly. You should also be running the Professional (purchased) version of MalwareBytes. Use Chrome or Firefox (not Internet Explorer) to browse the internet and, if possible, enable script blocking in your browser. Double check that you have a good backup plan for all of your important data. You should have multiple copies of recent backups for all files on all computers. At least one copy of your backups should be stored away in a safe place (not connected to your computer). As always, the instant you suspect that your computer has been infected by a virus you should immediately turn off your computer and contact a technology professional for assistance. DO NOT turn your computer back on until the threat has been evaluated! If you leave your computer turned on after a virus infection, you are giving the virus more time to damage your data. If you have any questions at all about this new threat or would like some additional help securing your data, please don’t hesitate to give us a call. We’re here to help. PS: Please share this warning with anyone you know who may be vulnerable to this virus. The frequency of the attacks appears to be accelerating. Looking for a great IT job in Arizona? Why not help Phoenix area businesses save money and increase productivity while expanding your technology skills with my PC Techs. We are Arizona’s reliable team of business technology experts and our team has an immediate opening for a Business IT Consultant. As part of the my PC Techs family, you will have the opportunity to apply innovative business computer repair and IT support solutions to a wide variety of different technology challenges on a daily basis. You will serve as an IT Manager, Sever Administrator, Computer Consultant, and Computer Repair Technician for multiple Phoenix area companies. Each day, you will help support a complex network of diverse business IT environments and will install, maintain, troubleshoot, repair, upgrade, and provide training for a hundreds of types of systems and software installations. As an on-site technician and IT support representative, you will maintain, repair, and support business information technology systems throughout Phoenix, Scottsdale, Chandler, and surrounding Arizona cities. You will troubleshoot and repair desktop computers, servers, point of sale systems, tablets, smartphones, and laptop systems and work with PC and MAC, as well as Android and iOS devices. Finally, you will interface directly with administrative and executive level staff at local businesses as a technology consultant, while reporting directly to the my PC Techs offices. Computer Pop-Ups Got You Down? How frustrating is it to be at your computer, just trying to get your work done, when all of a sudden you’re attacked by intrusive pop-ups? Sure, you might learn about the next big deal on hair removal products, but these distracting windows can prevent you from getting the job done. If you are getting annoying little popups while you work there’s a good chance your computer has a virus or malware. This intrusive and often dangerous software should be removed by a computer expert. Like the ones at my PC Techs. 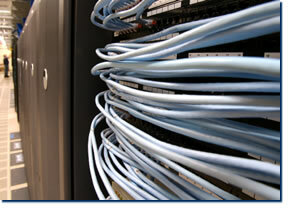 We provide Expert Technology Solutions You Can Trust. You don’t have to know much about computers, all you need is our number. We can help! Call my PC Techs at 602.456.0150 and get your work done faster. We always ask new clients if they would like us to come out on a regular basis to perform routine computer maintenance. Regular maintenance on your computer systems can extend the life of your machines by many years, and in many cases will help prevent catastrophic failure. As an example, we recently came upon a laptop that was given to us for repair. The system hadn’t been maintained in over three years, and in this case the system fan had stopped spinning. The fan was locked up as a result of dust buildup. All kinds of bad things happen to a laptop or desktop when a system fan stops spinning. 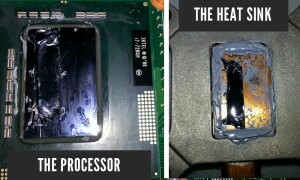 Here, without air circulation the CPU (processor) became so hot that the CPU’s metal fused to the metal on the heat sink. As you can see in the image below, there’s actually a strip of metal from the CPU melted on to the heat sink itself. Unfortunately, this is a costly repair requiring a replacement of the fan, heat sink, and CPU. It’s not as bad as it could be, however. The system board itself didn’t melt. We’ve seen that happen on some systems in a similar situation where the system fan had failed. This failure could have been prevented with regular maintenance. Dusting out your laptop and desktop fans and cases with compressed air will prevent heat and dust from killing them. Heat and dust are the #1 killers of computer systems and electronics! Just like your car, your computers need regular care too if you want them to last longer. Extend the life of your computers, let my PC Techs help you maintain them with regular visits. Give us a call, (602) 456-0150. We are now accepting resumes for an experienced computer repair technician. You MUST have 5+ years of hands-on PC troubleshooting, hardware and software. Good people skills are required, Macintosh A+. Pay DOE. Send detailed resume to jobs@mypctechs.com.